The Commission’s final inquiry report on reforms to human services was released by the Australian Government in March 2018. In a previous study report for the inquiry1, the Commission identified six services for which the introduction of greater user choice, competition and contestability would improve outcomes. These services are end-of-life care services, social housing, family and community services, services in remote Indigenous communities, patient choice over referred health services, and public dental services. The final inquiry report sets out tailored reforms for these six services. The Commission considers users should have choice over the human services they access and who provides them, unless there are sound reasons otherwise. A stronger focus on users, better service planning and improved coordination across services and levels of government is needed. Governments should focus on the capabilities and attributes of service providers when designing service arrangements and selecting providers – not simply the form of an organisation. There is no one-size fits all competition solution. The Commission’s recommendations aim to put the people who use human services at the heart of service provision. Change is needed to give people a stronger voice in shaping the services they receive, and who provides them. Each year, tens of thousands of people who are approaching the end of life are cared for and die in a place that does not fully reflect their choices or meet their needs. Reforms are needed to significantly expand community-based palliative care services and to improve the standard of end-of-life care in residential aged care facilities. Public dental patients have little choice in who provides their care and most services are focused on urgent needs. Long-term reform is needed to introduce a consumer-directed care scheme. This would enhance patient choice, and promote a greater focus on preventive care. A combination of rules and common practices limit patients’ choice of healthcare provider when they receive a referral or diagnostic request from a GP. These barriers should be removed. Patients differ in their needs and preferences, and providers differ in their locations, performance, waiting times and out-of-pocket charges. All patients should be given the opportunity to choose the provider that best meets their needs. Better public information is needed to support choice, and encourage self-improvement by providers. Current approaches to commissioning human services in remote Indigenous communities are not working. Governments should improve commissioning arrangements and should be more responsive to local needs. This would make services more effective and would lay the foundation for more place-based approaches in the future. Governments fund family and community services – such as services for homelessness and family and domestic violence – to assist people at risk of hardship or harm. These services are not delivering the best possible outcomes for people who use them, their families or for the governments that fund them. Practical changes to system planning, provider selection, and contract management would sharpen focus on improving outcomes for service users. The social housing system is broken. A single system of financial assistance, which is portable across rental markets for private and social housing, should be established. This would provide people with more choice over the home they live in and improve equity. Tenancy support services should also be portable across private and social housing. Many people approaching the end of life cannot access the type of care that aligns with their needs and preferences. Service availability varies widely according to patients’ diagnosis, age and location. Many patients undergo avoidable, or unwanted, hospital admissions, often associated with confusion, and a loss of dignity and control. Few people who would like to die at home are able to do so. The Commission found that a number of reforms could provide significant benefits for those requiring end-of-life care2. Many people approaching death have a medical condition that is amenable to palliative care, and have family and friends who are able to care for them at home. However, the demand for end-of-life care in the community (community-based palliative care) far outstrips availability, particularly for those with illnesses other than cancer. Better meeting this demand will require State and Territory Governments to substantially increase the availability of community-based palliative care, and to fund that increase. While offering service users a choice of provider should be the long-term goal of governments, the first priority should be better meeting demand. 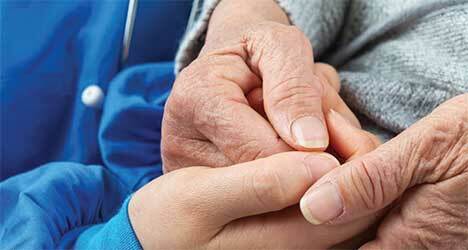 All aspects of end-of-life care should be core business for residential aged care facilities. Under current arrangements, many people do not get the clinical care they need at the end of life. Intensive nursing and other end-of-life care services are only funded in the last week or days of life, and are not available to those with pre-existing high health care needs. Two main reforms are needed to address this. First, residents require greater access to services delivered by clinically qualified staff. Second, consumers and their families need more information to help them select aged care facilities that deliver high quality end-of-life care. Aligning care to people’s preferences is critical to the effectiveness of end-of-life services. Preparing an advance care plan (ACP) means people can have a real choice in the care they receive, even if they can no longer communicate that choice. Despite efforts to promote advance care planning, less than 15 per cent of Australians have an ACP. Reforms are needed to provide more opportunity for people to develop a high quality advanced care plan. State and Territory Governments are primarily responsible for end-of-life care in public hospitals and in people’s homes. The Australian Government is primarily responsible for end-of-life care in residential aged care and general practice. Coordination between these services is often poor. monitor and evaluate end-of-life care services.